I find Held gloves to be very consistent for fit from one model to the next and these are no exception. Choose the size you wear in Held, or use the sizing advice above to choose. I just finished with the review of the Race-Tex glove by Held and this Rain Cloud glove is a very closely related cousin… not as many race glove features, but still the very desirable basic chassis with the Gore-Tex liner installed with the X-Trafit™ technology. The technology offers the waterproofing and breathability of Gore-Tex along with a manufacturing process that “bonds” the membrane to the glove so it reduces bulk. In trying them on, it is really hard to tell that the glove is even a waterproof model. I found a link to a good explanation of this process on Gore-Tex’s website. 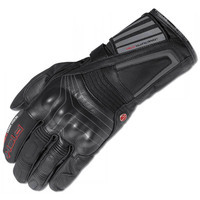 As you would expect there is a significant amount of protection build into this glove but the overall styling will appeal to street/touring riders. For example, there is molded protection over the knuckles, but rather than it being on display, it is situated under a layer of leather with a tasteful silver graphic to add a bit of style. Like the Race-Tex, this one also has the SuperFabric in the heel of the hand. That fabric is super tough and slides easily when it hits the ground. Some other race gloves use a molded “slider” for this, but the SuperFabric is softer and more comfortable and practical for everyday riders. I like the mix of materials used in this glove. There is a neoprene sort of material on the thumb and fingers that feels nice and instantly molds to your hand. And the lining is soft and plushy. With the waterproof liner and the inner liner, I’d bet these gloves would keep your hands warm too. They aren’t insulated but they feel like they’d hold their own into pretty cold temps to me. The left glove has a nice visor wiper and of course the gloves have a wrist strap to secure the gloves on your hand so they won’t come off if you fall. The gaunt is adjustable too. We tried to find the Scotchlite reflectives Held mentioned in the feature list above, but we couldn’t get anything to light up. Oh well, maybe it’s a typo.